Soda blasting is an environmentally friendly way of removing paint, dirt, coatings, and other surface contaminants without causing damage to the surfaces being cleaned. Similar in concept to sand blasting, the soda blasting machine uses compressed air to deliver sodium bicarbonate (baking soda) onto the surface to be cleaned. When the blasting media comes into contact with the contaminant on the substrate, the sodium bicarbonate particles explode, disrupting the contaminate surface without affecting the substrate. Although similar to traditional sand blasting, it has the significant advantage of cleaning the surface without causing harm to the substrate or the environment. Soda Blasting easily removes carbon, grease, oils, gasket material, surface corrosion, paint and coatings from a variety of alloys, plastics and composites without substrate damage or distortion. Soda Blasting leaves hard anodized coatings intact. The unique properties of sodium bicarbonate allow it to remove paint, grease, mold, oil, soot, and other contaminants without damaging glass, chrome, and even thin sheet metal. It is also possible to soda blast other softer substrates such as fiberglass, wood, plastics, carbon fiber, and aggregate. Soda blasting is unique in that no other blast medias that have these same characteristics. Perfect for these applications and more! The soda-blasting process was developed in the late 1980s by a group of New York City engineers who were given the task of restoring the Statue of Liberty. The two primary concerns from the onset of the project were the impact on the environment and not damaging the soft copper plating on the statue. They met these concerns by developing the soda-blasting process, using sodium bi-carbonate (baking soda) as the blast media. The success of the Statue of Liberty restoration brought a lot of attention to the soda-blasting process, and soon, many commercial enterprises were discovering new applications for the process. As with any new technology, imperfections were noticed, and the need for other variations of blasting media grew. Dry ice and walnut shell blasting media are two of several media that we offer. We will help you determine which media is best to use for your project. Prior to soda, sand was the main blasting media. Sand blasting, however, is abrasive and erodes the substrate coatings, pitting glass, tearing rubber, plastic and etching metals. Sodium Bicarbonate is a non-hazardous food grade material that is 100% water soluble and environmentally safe. Soda Blasting will eliminate the need of using toxic cleaning chemicals. Soda Blasting will clean multi-layered surfaces to any level desired. Soda Blasting may be used to clean while machines and processes are in operation. Another major advantage of soda blasting is rust elimination. Soda does not break down the surface tension of metals, thus the problem of flash rusting is eliminated. Sodium bicarbonate can act as a rust inhibitor, which will leave a protective coating on the surface being cleaned. This allows for time to pass before the surface has to be painted. This is unlike a sand blasted surface that must be painted immediately. When the time arrives to paint the surface, the protective coating (soda) can be removed by an application of a vinegar/water mixture. 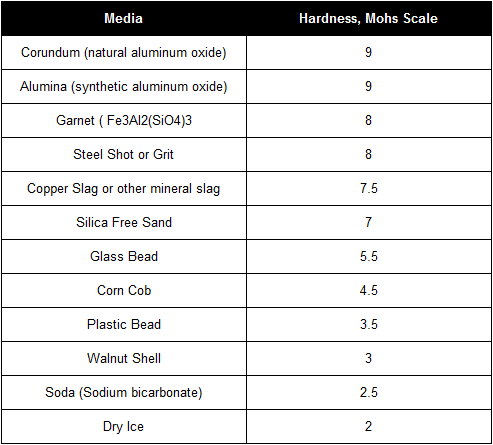 Hard abrasives seven and above on the Mohs scale (see below) mostly remain intact, therefore most of the force is directed into the substrate. Softer abrasives such as glass beads and soda crystals shatter on impact and part of the forces are directed in other directions as the particle "explodes" into finer fragments. Some of the fragments travel along the substrate perpendicular to the initial direction of impact. These fragments moving along the surface do a remarkable job of cleaning. Soda blasting provides a very valuable alternative to the costly, conventional methods of graffiti removal. Because it is a non-abrasive media, soda blasting can be used to remove graffiti on brick, sandstone, marble, and other sensitive surfaces without leaving any evidence behind. In addition, a wet blasting nozzle provides a nearly dust free method of cleaning. We do provide baking soda blasting services to the disaster restoration industry. 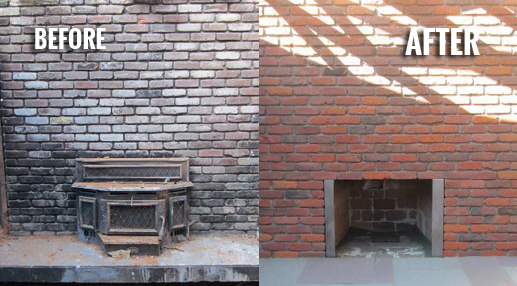 Due to its low relative hardness of 2.5 and its exceptional odor neutralizing properties, baking soda blasting is a natural choice for restoration professionals. Removing smoke, soot and char from buildings is a slow and expensive process. Soda blasting removes smoke and soot damage from brick, concrete block, concrete, interlocking stone, wood studs, joist, truss, sheathing materials. Baking soda not only removes the visual damage during the blasting process, but the natural deodorizing properties of baking soda work to eliminate the "smell" associated with the damage. Fire, smoke and the accompanying ash are typically at the high end of the pH scale (strong bases ), where baking soda works quickly in absorbing odor. The longer that the air in the affected area is in contact with the baking soda, the more neutralizing takes place. The specially formulated sodium bicarbonate is also known as a common household product -- baking soda. This non-toxic, food-grade material is 100% water soluble and environmentally safe. Sodium Bicarbonate is recognized by the US Food and Drug Administration as an A1 Cleaner, so a non-contaminated blast pot can blast food processing and food preparation equipment. One can maintain a pristine blast pot by never putting anything else but pure Sodium Bicarbonate in it.